Founded in 1956, Parksdale Farm has grown into a massive operation that harvests three million pounds of strawberries as well as red grape fruit, navel, temple and valencia oranges, tangerines, tangelos and vegetables from several hundred acres of land around central Florida. The Market, which opened in the 1960s, sells this produce to the local population. The Parksdale Farm Market has become famous among the local population for its strawberry shortcake, and is usually crowded. Most people them also pick up fruit while they're there, and you can see workers at a conveyor belt packing citrus into half bushel basket-sized bags. If you're in the area, the market is probably worth a trip. Address: 3702 West Baker Street, Plant City, Florida. Hours: 9 a.m. to 6 p.m., 7 days a week. 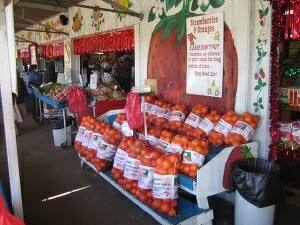 Find more fruit hot spots like Parksdale Farm Market in the fruit hunting section. Learn about a healthy raw food diet here.